By Jeff Aranow: Junior middleweight contender Erickson Lubin says that Errol Spence Jr. is going to have too much size for Mikey Garcia in their fight on March 16, and he sees him easily winning the fight based on his size. Even though Mikey is doing an admirable job of bulking up with his strength coaches at the SNAC facility in San Carlos, California, Lubin doesn’t think that’s going to change anything for him against the hulking 5’9 1/2″ Spence, who is naturally big and doesn’t need to bulk up. Lubin sees Spence (24-0, 21 KOs) as too big and too strong for former four division world champion Garcia (39-0, 30 KOs. It doesn’t matter how much weight Garcia puts on. 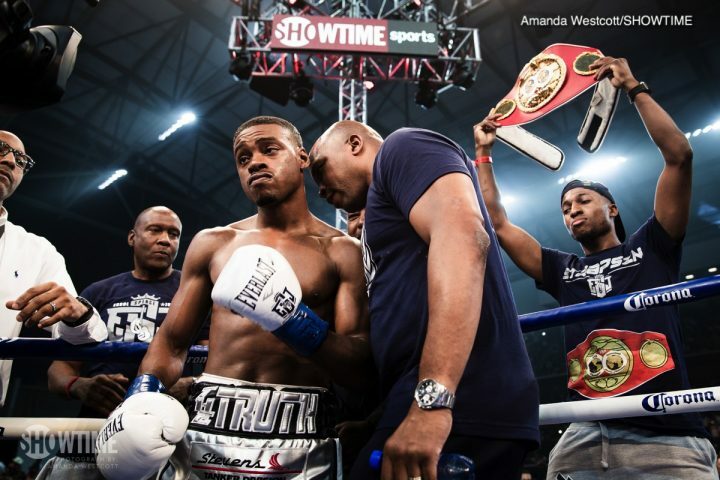 Spence will have his IBF welterweight title on the line against Garcia on March 16 on FOX pay-per-view at the AT&T Stadium in Arlington, Texas. “I think Spence is too big,” junior middleweight contender Erickson Lubin said to Behind The Gloves in predicting the outcome of the Errol Spence Jr. vs. Mikey Garcia fight. Spence will be too big for him. Garcia, he’s a good fighter, but I feel Spence is going to be able to walk through him,” Lubin said. Trainer Virgil Hunter thinks Mikey is using the wrong approach in bulking up for the fight. Hunter believes that the extra size that Mikey puts on for the fight will make him tire earlier in the contest, due to him not developing his cardiovascular system at the same time. Hunter feels that Mikey is putting on too much weight in a short period of time, and he thinks he’s making the same mistake Amir Khan made in him bulking up to fight Saul Canelo Alvarez in 2016 at middleweight. Khan fought well in the first four rounds against Canelo. Khan then he got tired in the 5th, became stationary, and was stopped in the sixth. “I think where he [Mikey] has to be careful is like Khan vs. Canelo, where you carry around extra weight in the ring,” Hunter said to Behind The Gloves. “It does put a difficult demand on your oxygen capacity, particularly in the actual fight. The question is, is his [Mikey Garcia] body used to carrying around that extra weight, and that extra bulk in a fight after three to four months of putting it on? I always say the strength and conditioning is not done in one fight. It’s done over a span of fights and time where it really takes effect,” Hunter said. There are some rare examples of fighters bulking up and doing well, but mostly it works against them if they’re not able to use their new size to score a quick stoppage. Roy Jones Jr. and Sugar Ray Leonard were able to move up in weight and get big wins, but nether of them stuck it out in those weight classes. Jones moved up to heavyweight and beat champion John Ruiz. Jones didn’t stick around to fight Lennox Lewis or the Klitschko brothers. What Mikey is trying to do in moving up two weight divisions to try and dethrone IBF welterweight champion Spence is going to be very tough for him to try and do because he’s not testing out all bulk that he’s put on by fighting someone in the 147 lb division before he faces Spence. Without testing his conditioning is going to be hurt or not by the added weight, Mikey is flying blind. It’s very ikely that Mikey will only be able to fight hard for the first four rounds, and from that point, he’ll be fighting on fumes. Mikey gassed put after six rounds i his fights against Adrien Broner and Sergey Lipinets, and he punishment in both fights. That was just at 140. Mikey is puttig on a lot more size in going up to 147, and it’s going to be a lot harder for him to fight without fading quickly, especially with the fast pace that Spence will be setting put. Spence will also be throwing a lot of body shots, which is goig to cause Mikey to fade even faster. “You can have the visual look of it,” Hunter said. “You’ll be able to progress in the exercises if you do it on a consistent basis. But to get the true benefit of strength and conditioning, it has to be done over a period of years. So, it’s a big jump up in weight. If he [Mikey] comes in over 150, he can possibly feel the extra weight, particularly at the pace Errol Spence fights. It’s going to be a pace where he’s going to have to be active three minutes of every round,” Hunter said. Mikey hasn’t fought a really good pressure fighter since his fight with Orlando Salido in 2013. That’s a long time ago. That fight ended after eight rounds after Mikey’s trainer/brother Robert Garcia complained to the referee that he couldn’t breath out of his broken nose. In hindsight, that looked like Robert made a move to save Mikey, who was exhausted from the pressure that Salido was putting on him, and he was no longer dominating him like he’d been doing n the first six rounds. The fight started changing in the seventh when Mikey lost energy, and started taking body and head shots form Salido. It was like an hourglass lose sand rapidly. Mikey was losing energy, and he looked in distress at the time that Robert told the referee that his fighter was injured. If that’s the game plan for Mikey against Spence, then you can expect short five round fight. All Mikey needs to do is build a 3 rounds to 2 lead after five, and he could potentially bow out with an injury, which would mean the fight would go to the scorecards. The judges would tabulate the scores up to that point in time, and decide a winner. It’s a obviously a cheap way to win a fight, but it’s done. Nonito Donaire captured the WBA Super World featherweight title in 2014 in beating champion Simpiwe Vetyeka by a 5th round technical decision after sustaining a cut eye. It went to the scorecards after five rounds, and Donaire was given a technical decision to defeat the WBA champion Vetyeka. A lot of boxing fans thought Donaire could have kept fighting with the cut, but he complained that he couldn’t see out of the eye, so the fight went to the cards. You hope that Mikey won’t get injured in the first half of the fight against Spence, but that happened previously with Mikey in his fight against Salido. There’s a history there. Salido is easily the toughest opponent that Mikey has ever fought before during his career, and that fight ended in an odd way. Now six years later, Mikey is facing a very good fighter in Spence, who is arguably more of a threat to beating him than Salido. Will Mikey build up a small lead in the first five rounds, and then complain of having an injury in order for the fight to go to the scorecards? That would be a lot of complaining from boxing fans if that’ what happens. “It’s just like when Canelo was fighting Khan,” Hunter said in comparing Mikey going up to welterweight to fight Spence with Amir Khan moving from welterweight to face Canelo Avarez at middleweight. “There was no lull in the action. So I could see the actual extra weight Khan was carrying begin to effect him around fifth and sixth rounds, and the reaction to speed as well, and he became more and more stationary. So that’s one thing you have to be worry of about. That extra weight he’s not used to fighting with could be a negative factor. You’ve got to acclimate to that weight. You have to assess what he’s walking around at, and where he’s doing his best sparring in camp. If he’s fighting at 135, his best sparring sessions might be at 142. So I think he should come in at his best sparring weight,” Hunter said. Boxing is a cardio sport. This isn’t weight lifting, body building or baseball, where it’s going to help you if you pack on size. For all the muscle weight that Mikey puts on, his heart is going to need to work that much harder. It doesn’t matter if Mikey has been steadily doing aerobics to condition his heart to carry all that extra weight. It’s still going to be harder for Mikey’s heart to pump blood to all that extra mass that he’s put on. If Mikey was a proven knockout threat at 147, then it wouldn’t matter if he gassed out in the second half of the contest, because the chances would be high that he would knockout Spence in the first six rounds. Mikey hasn’t fought at 147 so he could test out his power in that weight class. What we saw is Mikey’s power had no effect on the light welterweights Sergey Lipinets and Adrien Broner. Mikey couldn’t hurt either of those guys, which suggests that he’s not going to be able to hurt and even bigger Spence. “The extra weight isn’t going to turn into strength,” Hunter said. “You’re not going to be stronger than Spence, even though you have the extra weight and the extra muscle. That’s a three month period that you’re putting this on. It’s not over the years that you carried the weight to let your body totally acclimate to it,” Hunter said. The extra weight is going to help Garcia absorb Spence’s powerful punches. That’s the #1 area where adding weight will help him against Spence. The #2 area is it’ll keep Spence from shoving Mikey around to get him against the ropes or to force him to fight in a particular spot inside the ring. Spence was shoving his last opponent Carlos Ocampo around in his 1st round knockout of him last June. Ocampo is a big guy, but he didn’t have the strength to keep from getting shoved around by Spence. If Mikey packs on enough size, then it could be tougher for Spence to push him around the ring. “So to be as light as possible to overcome to use the speed that he has to overcome the size [of Spence],” Hunter said. “Even if you weighed the same, you’re out-sized, because it’s not a natural weight for him. It’s where he has to be careful, not to come in too heavy, and not to try and match Errol’s weight pound-for-pound. But rather to go to the best sparring weight for him,” Hunter said. It’s too late at this point for Mikey to come in lighter for this fight. There’s only like five weeks to go, and Mikey has already packed on a lot of bulk in training hard for the last two months. He’s not going to lose all that bulk that he worked so hard to gain. It sounds like if Hunter was Mikey’s trainer, he would have him come in as light as he normally is in order to try and win the fight based on his hand speed. If Mikey chose to ignore Hunter’s training advice, he would go to the SNAC facility anyway in order to follow his insticts that the way to beat Spence is to bulk up and try and overpower him. “Of course,” Hunter said when asked if a Mike victory over Spence would be considered a big upset. “It’ll be a REAL big upset. I think anybody in boxing would say that. I can’t think of anybody that would confidently go and put $1000 on Mikey right now. Just a straight $1000. It’s not that he can’t do it. It’s that you haven’t seen him under those circumstances. You haven’t seen him in that type of [high pressure] fight, a rugged fight. I’m sure he’s going to land his share of punches. I’m sure his IQ is going to come into focus, but that constant pressure that makes you redirect your IQ. It makes you have to reassess that situation. That constant pressure of just being hit on, where have to, ‘Man, if he catches me with those, I could be hurt.’ So it’s a mental fight. He’s [Mikey] got to be mentally in tune every second of every round. He’s got to know where and when not to. But its a fight. Anything can happen. He believes in himself. Belief can go a long way,” Hunter said.